Planning, measuring, and paying attention to details form the basis for all successful engineering operations. Measurements pervade everything we do and must be viewed from a systems perspective. 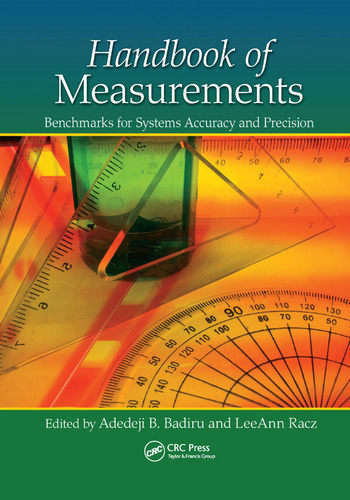 A comprehensive all-encompassing guide to measurements, Handbook of Measurements: Benchmarks for Systems Accuracy and Precision focuses on high-level engineering computations essential for benchmarks and technical innovation. The book uses a systems framework and a technically rigorous approach to systems linking of measurements—an approach that sets it apart from other handbooks. The popular saying "measure twice and cut once" bears out the importance of measurements in human endeavors. This handbook covers both qualitative and quantitative topics of measurement. It opens with a chapter on the fundamentals of measurement and includes coverage of human-centric measurements, such as measurement of personnel productivity and contractor performance. It concludes with three appendices on measurement, references, conversion factors, equations, formulas, and statistics for measurement. It is well understood that humans cannot manage anything that cannot be measured. All elements involved in our day-to-day decision making involve some form of measurement, whether in the kitchen, retail, sports, service operations, geographical exploration, health care delivery, worker productivity, clothing design, engineering product design, or space craft launching. Measuring an attribute of a system and then analyzing it against some standard, some specification, some best practice, or some benchmark empower a decision maker to take appropriate and timely actions. This book gives you a guide for sustainable practices to ensure accurate measurements, helping you make decisions backed by metrics. Adedeji Badiru is a Professor of Systems Engineering at the Graduate School of Engineering and Management at the Air Force Institute of Technology. He is a registered professional engineer (PE), a certified Project Management Professional (PMP), a Fellow of the Institute of Industrial Engineers, and a Fellow of the Nigerian Academy of Engineering. His areas of interest include mathematical modeling, project modeling, economic analysis, and productivity analysis and improvement. He has been recognized with numerous awards for his teaching, research, service, publications, and managerial accomplishments. LeeAnn Racz is a Lieutenant Colonel in the US Air Force and currently serves as a Bioenvironmental Engineering Flight Commander at RAF Lakenheath in the United Kingdom. Her past assignments have included Deputy Head of the Department of Systems Engineering and Management at the Air Force Institute of Technology as well as assignments in Texas, South Korea, and New Mexico. She has published numerous books and journal papers, holds a PhD in Civil and Environmental Engineering, and is a licensed Professional Engineer (PE), Certified Industrial Hygienist (CIH), and Board Certified Environmental Engineer (BCEE). "This text fills an important gap in literature by condensing the subject of measurements into a single volume and hence acts as a reference material for students, practicing academics, and professionals wishing to take a systemic view of their subject domain." "Badiru (Air Force Institute of Technology) and Racz (RAF Lakenheath, UK) have gathered the efforts of a wide array of scientists, engineers, academics, and professionals in this excellently curated collection. Beyond the basics of physical measurements and general statistical analysis, this book features well-chosen, cross-disciplinary chapters focusing on many different types of study. From investigating human factors and health to risk assessment and forecasting, economics, and science, chapter contributors address the most common devices, tests, limitations, and issues affecting their area of expertise. While many sections include some higher-level math and statistical techniques, these are usually contextualized in a way that is open to those simply getting started in the field. Lower-level readers may especially appreciate the history of and basic introduction to discipline-specific techniques, as well as an excellent appendix of definitions and illustrations of statistical concepts. As more fields and universities feature data-driven programs and research, more scholars are looking for materials that will introduce them to study techniques and methods. The Handbook of Measurements works well as both a quick reference and a more in-depth look into the issues affecting research in a wide variety of fields." "Handbook of Measurements fills an important gap in measurement references, and I strongly recommend it to a wide audience of engineering educators, students, and practicing engineers in industry who are interested in the subject of measurements."